Among the many things that Nashville does well, their Farmers Markets are high up on the list. Since we enjoy food so much, JD and I are obviously big fans of farmers markets. Last Saturday, we stopped in at the Franklin Farmers Market south of town, and we were quite pleased with how organized, big, and fun the Franklin site was. While there, after having a yummy biscuit and the best homemade doughnut I have ever eaten, I grabbed some peaches, broccoli, and a large bunch of kale. I have never prepared kale, but it is, by far, my favorite thing on the Whole Foods salad bar. I should try to make it myself! A friend suggested she heats it a bit like spinach and mixes it with olive oil, but I had in mind using it as a salad. So, I researched and found the Whole Foods-endorsed recipe for the salad dressing. 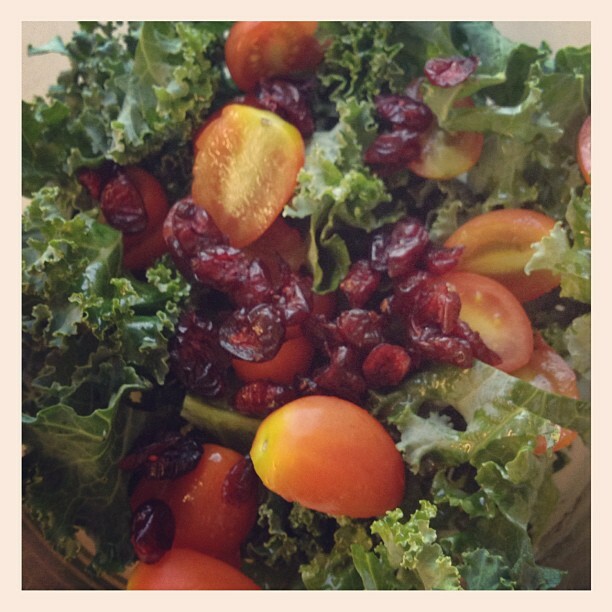 I mixed the dressing, halved cherry tomatoes, and craisins to the kale, and that has been my lunch most of this week. It’s been quite yummy, and kale is one of those wonderful super foods that are great for you. Here’s the salad recipe below. In a large bowl, whisk together oil, lemon juice, chili powder and salt. First. YES! Kale salad recipe. Making it this week! Second. Biscuits. We are HUGE fans of Karl + The Biscuits Luv Truck here, Chez Payne. Which one[s] did you have? The Gertie is mind-blowing. Seriously.